Winter is coming, or for many of us, winter is already here and is in full-force. Along with the frigid temperatures and slippery roads comes a new challenge: ice melting salt. 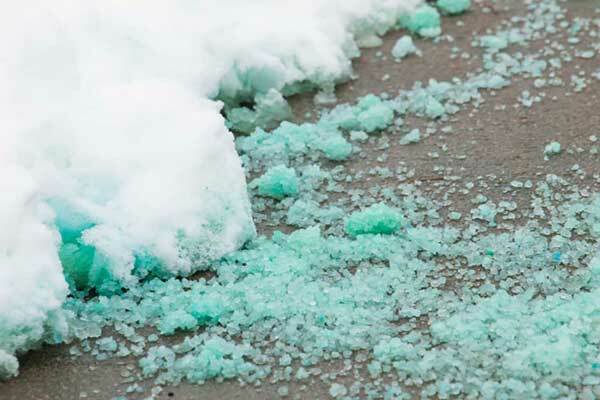 While necessary, ice melting salt can wreak havoc on your home or business’s floors. Luckily, Conn Clean offers a variety of clean-up services to prevent and protect your floors against salt damage. First, let’s discuss what exactly melting salt does: the salt works to lower the freezing point of water on roads and sidewalks, meaning that it won’t turn to ice when the outside temperature reaches 32 degrees fahrenheit. The water can then melt whatever ice is left and clear the roads. So, how exactly does this salt damage your floors? Ice melting salt is usually made with calcium chloride, which is known for leaving those white, powdery marks on floors. If those marks aren’t cleaned properly, they will eat away at the floor’s finish or leave unsightly stains on carpeting. The best way to begin the fight against melting salt is to temporarily install entry mats at all the doors of the building. The mats will capture the first few steps of salt and ice that are stuck to your guests’ boots, eliminating a high chance of potential damage to your floors. After the mats are covered in residue, a wet/dry vacuum is the best option to clean everything up. Conn Clean offers a variety of vacuuming services as part of our maintenance program during the winter time. While entry-mats are effective in collecting the majority of winter debris, they aren’t completely foolproof, and some ice and salt will inevitably end up on the rest of the floors. For these larger areas, Conn Clean suggests a walk behind wet/dry-squeegee vacuum as well as an air mover, leaving your floors dry and protected from damage. Don’t let floor damage be a constant combat this winter. Conn Clean offers all the services you’ll need to keep your floors safe and protected from salt damage.